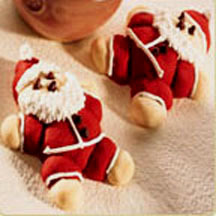 You and your children will have a "ball" rolling out the dough to form these whimsical, jolly little Santa cookies! Preheat oven to 325°F (160°C). Using a mixer, beat butter until fluffy. Add sugar; beat until well combined. Beat in milk and vanilla extract. Beat in flour. If you are not using a heavy duty mixer, it will be necessary to beat in the last of the flour by hand. Remove one cup of dough and set aside. Beat food coloring into remaining dough to make a bright red tone. Form the plain and red doughs into 12 balls each. With red dough, separate each ball into one 1-inch ball and five 1/2-inch balls. With plain dough, separate each of the balls into one 3/4-inch ball and four 1/4-inch balls. Shape the Santas: Slightly flatten the 1-inch red ball on an ungreased cookie sheet. This is Santa's "body". Place plain 3/4-inch ball on top of red ball for head; flatten slightly. Attach the four red 1/2-inch balls for arms and legs. Attach the last red ball as a cap on top of Santa's head. Reshape cap slightly to form a triangle. Attach the four 1/4-inch plain balls for Santa's hands and feet. Lightly press the balls against each other so they hold together. Add miniature chocolate chips to face for eyes and nose. Bake 12 to 15 minutes or until lightly browned. Remove from oven and leave cookies on baking sheet for 2 minutes. Remove to racks to cool. Using star tip, squeeze the decorator frosting to form a mustache and beard on Santa's face. Also, form a ball at the tip of his cap and rim at the bottom of his hat. *You may use traditional red liquid food coloring, but it will take a larger amount to achieve the same vibrant color.